"It's easy to set up and kids love it." "The bottom of the pool gets inflated to provide your baby some cushioning against the hard ground." "A great first introduction to water before they're ready to dive into a bigger pool." "The UV-resistant shade also has a sprayer on top to keep the pool nice and cool." "You can have it set up and ready to fill with water in just 30 minutes." "Your children will have to scale up an inflatable rock wall to get to the top … where they fly down into a kiddie pool." "A great option to pull out for birthday parties." For kids who are looking for a little more water action, there’s this bright, inflatable play center that will keep them busy for hours. It comes with a water slide, wading pool, ring toss game and a ball roller game, complete with balls and rings. It also comes with a water sprayer, which can be attached to a garden hose, for extra wet fun. It measures 15.98" x 15.98" x 5.51", and holds up to 77 gallons of water. Recommended for ages 3-7, there’s room for several kids to play at a time. Customers rave about this product and say it’s easy to set up and kids love it. What better way to cool off baby (and yourself) on a hot summer day then in a cute little pool made just from them. This pool measures 58" in circumference and 13" in depth though you only need a few inches of water to provide your little one with the relief. The bottom of the pool gets inflated to provide your baby with some cushioning against the hard ground or rocks. The pool takes minutes to set up and just a few minutes to fill. As with all kiddie pools, never leave your child unattended. Your kid will enjoy this past babyhood as a nice place to sit back and relax. If you plan on hosting any barbecues you could even fill it with ice as an impromptu cooler. For the tiniest tots, this friendly giraffe will provide a splishin’ splashin’ good time. Designed for babies as young as 12 months up to age 3, it’s a great first introduction to water before they’re ready to dive into a bigger pool. It measures 44" x 36" x 28 ½" and holds up to 14 gallons of water, so it’s just big enough to sit and play, but light and portable enough to move around or take to the park, beach or pool. It also comes with two inflatable rings and two dangling noisemakers for extra fun and a patch in case it springs a leak. Also, did we mention how adorable it is? Too much time in the sun can leave skin scorched. For those times when you don’t want to cut the fun short, there’s this pool with shade built right in. The UV-resistant shade also has a sprayer on top to keep the pool nice and cool. The pool is big enough for several people to soak at a time. Made with rust-resistant, galvanized metal frames, it’s built to be durable. Customers say it’s a great pool that exceeds expectations. “This is really nicer than I imagined,” one wrote. “Pleasantly surprised,” said another. Basically, they’re saying you’ll be made in the shade with this pool. When you want a bit more space for the water action, there’s this 12-foot pool from Intex. It’s 30 inches deep, and it comes with a filter pump to keep the water clean. The sides are made of laminated PVC to keep it sturdy, and a ground fault circuit interrupter is included which will automatically shut the pump off if water happens to come into contact with the electrical current. Set up is easy. With just three steps, the manufacturer promises you can have it set up and ready to fill with water in just 30 minutes. It also comes in larger sizes if you want even more space for swimming. Customers give this pool high marks all around for easy setup, low maintenance and lots of warm-weather fun. If your kids are into action this is the backyard adventure set you need. 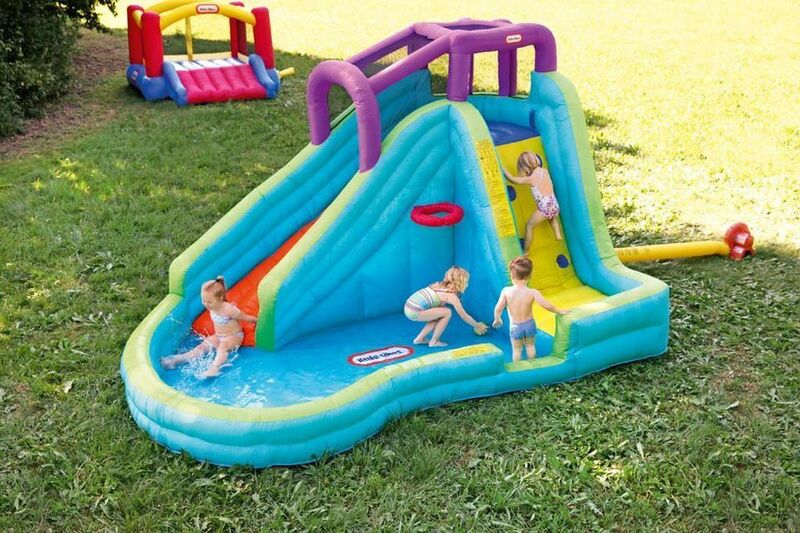 Your children will have to scale up an inflatable rock wall to get to the top of the slide where they fly down into a kiddie pool. Before they go back up they can shoot some hoops in the water and complete the whole cycle again and again. This pool is sure to be the hit of the neighborhood. Just be aware that it has a 350-pound weight limit so you can't have all the kids from the block on it. Reviewers note this is a blast but say it can take hours to fill up and you should leave a hose running on the slide so your kids can slide down without getting stuck. If your space and budget allow something over the top this Blast Zone is for you. With it they'll get a slide, water blasters, a climbing wall, a pool and much more, all in a fun pirate theme. What's best about this is a blower is included to set it up in minutes and keep it full and functioning till the sun sets. While you might not want to have this set up every day in your backyard, this is a great option to pull out for birthday parties, BBQs and any hot days for a fun cool off that will have the whole block talking.